1. Crush 2-4 Oreos and set aside. These will be used to sprinkle on top of the Truffles. 3. Mix in 1 8 oz. package of Cream Cheese. 4. Form Oreo/Cream Cheese mixture into balls and place on a cookie sheet with wax paper. 5. Put truffles in the refrigerator, so they will harden a little bit and hold their shape while they are coated in the Almond Bark. 6. Melt the Almond Bark according to package directions. 7. Dip each truffle in the chocolate coating and put on the cookie sheet. 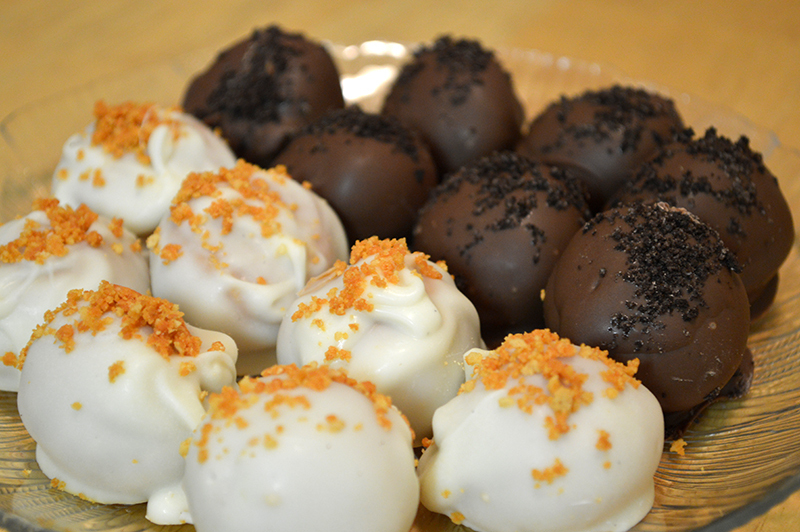 Sprinkle some of the crushed Oreos on the top of each truffle before the chocolate hardens. 8. These can be stored in a covered container in the refrigerator. I love Oreos and have found the most amazing way to use them. Oreo Truffles are the best thing ever. You can use any flavor Oreo that you like. You crush a package of Oreos, mix in a package of Cream Cheese and then you coat them in White Chocolate or Milk Chocolate. One of the nice things about this recipe is that the final product has that perfectly crisp shell with the super soft and rich interior. Our favorites so far have been the regular chocolate flavored Oreos, the mint flavored Oreos and the Pumpkin Spice flavored Oreos. These are a guaranteed hit at any party or get together. Just make sure you make plenty, nobody will be content with just getting one or two.